After an introduction to the event and a welcome to the library by the University Archivist Carole McCallum, Dr David Featherstone explained some of the reasoning behind the concept of Banner Tales. Displays and discussion of historical political banners had proved an invaluable method of getting people to recall stories of activism that may have otherwise been lost to time. It also allows communities to share and understand their contribution to society. The event was recorded and will later be transcribed. The first speaker was John Nelson, Secretary of ACTSA Scotland (previously Secretary of the Anti-Apartheid Movement Scottish Committee). He started by talking of attending his first Anti-Apartheid meeting back in 1966 and his words gave scope to the breadth of the Anti-Apartheid Movement in Scotland. Indeed, he noted that he had heard rumours that the word ‘Aberdeen’ was to this day still reviled in parts of white South Africa. It was apparent that John’s history and that of Anti-Apartheid activism were synonymous. 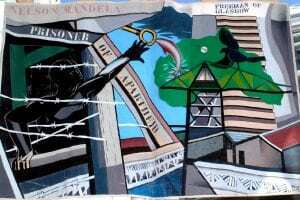 In their words, John Nelson and Brian Filling encapsulated so much of the struggle, tumult and eventual exultation of the Scottish Anti-Apartheid Movement. 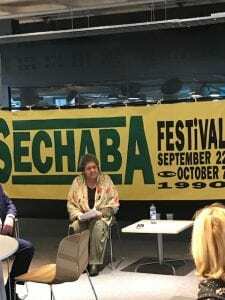 Seated in front of the huge and vibrant Sechaba Festival banner, Suganya Chetty spoke movingly of her family’s experience and of coming to Britain half a century before. Her voice cracking with emotion, she read a poem and explained what the word Sechaba meant to her. The banner by osmosis seemed to make the assembled remember and reflect on their own experiences. Brian Filling spoke again about the task of staging the Sechaba festival. There were memories shared of the difficulties on putting on an event on such a scale. Audience members talked about putting performers up in their own homes, a signifier if ever there was one of the famous Glasgow hospitality. Any difficulties encountered were worth it. As one audience member noted – it was something they could look back on and been proud to have been a part of. There followed a nuanced and thoughtful discussion on the issue of boycotting South Africa cultural exports. A lightning rod was the Paul Simon album Graceland – recorded in South Africa with native musicians and thus flouting the cultural boycott. It was the view of one audience member that what the Sechaba Festival had succeeded in was allowing the debate around the notion of total cultural boycott to play out amongst anti-apartheid activists. By having a festival full of South African musicians, it was no longer an issue that could have been ignored. The Banner Tales event as part of Black History Month was good-humoured but serious, reflective but forward looking. A worthy event and a heartening gathering on a rainy October afternoon – classically Glasgow weather reminiscent of how it had been on that special day 25 years earlier, when the great Nelson Mandela himself came to visit. As is often the case at such events, t-shirts, Sechaba audio recordings and various memorabilia were kindly donated by activists to GCU Archive Centre, and for that we are very grateful. In words, reminiscences and tangible items, the memories will live on to inform future generations.